Red meat is one of the most controversial foods. Whether or not red meat consumption is good or bad for health has been a hotly debated topic for years. Several areas that researchers have studied regarding the harmful effects include the saturated fat and heme iron in red meat, and the carcinogens that form when meat is cooked. As a result, eating red meat is thought to increase the risk of dying from cancer and heart disease. Heart disease will also increase the risk of heart failure. In a new study published in the journal Heart, researchers from the University of Leicester in the U.K. have linked higher levels of a compound in red meat called TMAO (trimethylamine N-oxide) with worse outcomes in acute heart failure patients. Red meat is a source of L-carnitine, which is broken down by gut bacteria when the meat is digested. Previous studies have associated TMAO with a greater risk of chronic heart failure-related death. That being said, the current study is the first to link TMAO with acute heart failure. Heart failure doesn’t necessarily mean the heart has stopped, or is about to fail. However, it is serious condition where the heart is not pumping enough blood throughout the body, and sometimes the heart cannot fill with enough blood. It is estimated that about 5.1 million Americans suffer from heart failure. Also, heart failure had caused one in nine deaths in 2009. For the study, the researchers would measure TMAO circulation levels in 972 patients with heart failure at the University Hospitals of Leicester National Health Service (NHS) Trust. The research team would examine the association between blood TMAO levels and certain events within a year from acquiring the blood samples. For instance, there were 384 death or rehospitalization from heart failure, 268 deaths from any cause, and 72 deaths during hospitalization. The researchers found that acute heart failure patients with higher TMAO levels at the beginning of the study had the greater chance of dying or being rehospitalized with heart failure within the year. It is important to note that red meat is not only source of the amino acid carnitine. It is also found in asparagus, whole-wheat products, cheese, and milk; however, the concentrations are much smaller. Research published in the Cell Press journal Cell Metabolism in 2014 would conclude that gut bacteria converts L-carnitine into TMAO, which also promotes atherosclerosis. It is not certain what type of red meat was included in the studies. But, it is thought that the type of red meat you consume matters. For example, grass-fed and organic meat is meat fed a natural and organic diet, and the animals are not pumped hormones, drugs, and artificial chemicals. On the other hand, conventional red meat does include potentially harmful ingredients. 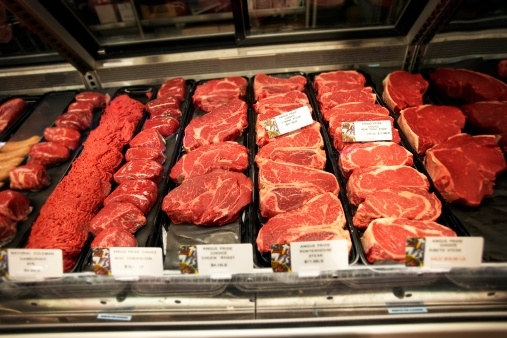 Although red meat has a bad reputation, it is also considered a very nutritious food. For instance, red meat contains high amounts vitamin B12, which is a vitamin not found in high levels in plant-based foods. Also, the high-quality heme-iron found in meat is better absorbed than the iron found in plant foods. “Red meat metabolite levels high in acute heart failure patients, research shows,” University of Leicester website, Feb. 18, 2016; http://www2.le.ac.uk/offices/press/press-releases/2016/february/red-meat-metabolite-levels-high-in-acute-heart-failure-patients-research-shows. “Heart Failure Fact Sheet,” Centers for Disease Control and Prevention website; http://www.cdc.gov/dhdsp/data_statistics/fact_sheets/fs_heart_failure.htm, last updated Nov. 30, 2015. “What Is Heart Failure?” National Heart, Lung, and Blood Institute website; http://www.nhlbi.nih.gov/health/health-topics/topics/hf, last updated Nov. 6, 2015.